After the delicious success of my Kale Avocado Smoothie, I knew I wanted to try another one with kale, too. 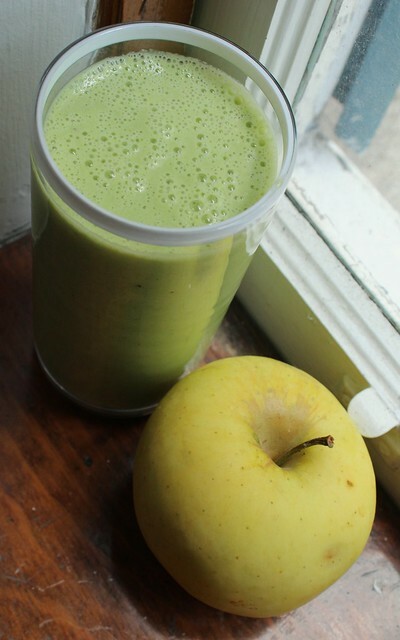 I have to say, I love the extra bit of sweetness that the chayote brought to this breakfast smoothie. I would definitely try this one again, and maybe even with a bit more chayote than the first time. This breakfast smoothie is made extra-sweet with the addition of chayote, a sweet edible plant in the gourd family that originated in Mexico with a texture similar to pears. Combine kale and parsley into a high-speed blender, add 2 cups of water and then blend until the greens are fully chopped. Add in the 0% fat Greek yogurt, lime juice, chayote and apples. Blend. Finally, add in 1 cup of water and blend again until it has reached the desired consistency. Makes 4 16-ounce servings of breakfast smoothie. Have you ever put chayote into your breakfast smoothie? This entry was posted in Breakfast, Fruits, Shakes and tagged apples, chayote, Greek yogurt, kale, smoothie by Irina Gonzalez. Bookmark the permalink.